Learn about the AVR-IoT WG developer board, which was developed to work with Google Cloud IoT Core. IoT-development-specific boards have become popular in the last couple of years due to the rise in IoT-connected devices. Microchip and Google have partnered to create the AVR-IoT WG development board that they claim will get you, “out of the box and into the cloud in 30 seconds”. Before testing that claim, however, let's take a look at the board’s main components and sensors. The Microchip AVR-IoT WG dev board features an AVR microcontroller, a CryptoAuthentication secure element IC, and a fully certified Wi-Fi network controller. Together, these components provide a secure, connected platform for your IoT projects. You should be able to transmit data to the cloud securely, and the MCU’s low current draw will extend your projects’ lives and capabilities. So let's take a look at what allows these capabilities on this board! An overview of the AVR-IoT WG dev board. Image courtesy of Microchip (PDF). This board runs off of the AVR 8-bit ATMEGA4808, equipped with 48 KB of Flash and 6 KB of RAM. It features 256 bytes of EEPROM, 4×16-bit timer (TCA/TCB), 20 MIPS/DMIPS CPU speed, UART (3), SPI (1), I2C (1) peripherals, and many Core Independent Peripherals (CIPs). It is compatible with graphical development tools, as well as commonly integrated development environments, allowing for rapid prototyping by users of different levels. To take advantage of this processing power, the board includes a Li-Po battery port and charger, USB power and debugging with UART communication, as well as light and temperature sensors. The battery charger monitors the life of the battery, alerting the user of its status through LED codes, as well as optional code. Combining this with the low-power MCU should drastically extend your project’s life. Along with the embedded LED and buttons, the board’s mikroBUS footprint supports over 500 add-on boards to further expand its capabilities. 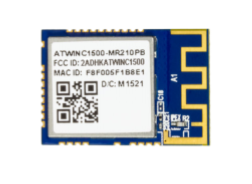 This board is specifically optimized for low-power IoT applications, as well as battery-powered projects with its low-power ATWINC1510 Wi-Fi 802.11 b/g/n IoT module and a single-band 2.4 GHz network controller, to connect your projects to the cloud. The IoT module. Image courtesy of Microchip (PDF). The 8 Mb of onboard Flash memory allows it to store various security certificates and takes care of the networking tasks so the microcontroller unit is free to do something else. The module integrates a power amplifier (PA), a Low-Noise Amplifier (LNA), power management, and a printed antenna or a micro co-ax (u.FL) connector for an external PCB antenna resulting in a small form factor (21.7 x 14.7 x 2.1 mm) design. It interfaces with the MCU through SPI. Google and Microchip have also partnered to create a development environment to facilitate connectivity. Every board is equipped with a pre-associated Google Cloud account that allows you to make your profile private when you are ready for production. For security purposes, the AVR-IoT WG Development Board contains the ATECC608A CryptoAuthentication secure element. 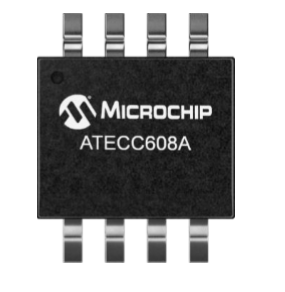 The ATECC608A module adds security. Image courtesy of Microchip (PDF). This security module protects your data transmissions into the Cloud with hardware-based private key storage (up to 16 keys at a time), cryptic countermeasures, and by obscuring private keys from both users and software. It supports Elliptic Curve Diffie-Hellman (ECDH), SHA-256, Elliptic Curve Digital Signature Algorithm (ECDSA), and AES-128 ECB/GCM encryption algorithms. It can do all of this with a typical operating current of 1 mA. 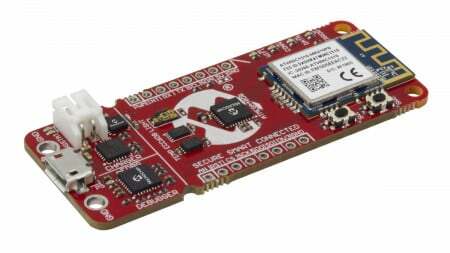 An IoT Development Board for Makers? 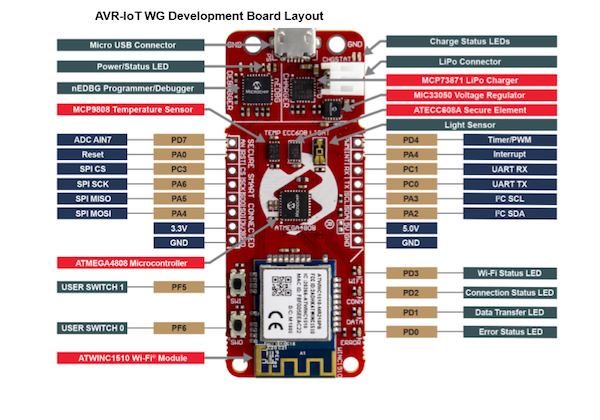 The new AVR-IoT WG Development board by Microchip includes many features for prototyping internet-connected hardware and should provide a smart, secure way to connect old or new projects to the web and monitor them as well. The low-power ATMEGA-48048 is the brain of the board, while the ATECC608A secures the information transferred by the ATWIN1510 Wi-Fi module. Overall, this new development board seems like a compact solution for small IoT project prototyping. So let's see if this board is an effective choice! In the next article, I'll be connecting this device to the Cloud to test Microchip and Google’s claim of connecting in 30 seconds or less. Stay tuned!